Two university professors never expected their idea to expand aerospace engineering education outside of the classroom would help democratize access to space, but the CubeSat revolution shows no signs of stopping, with everyone from Silicon Valley start-ups to intelligence agencies taking notice. 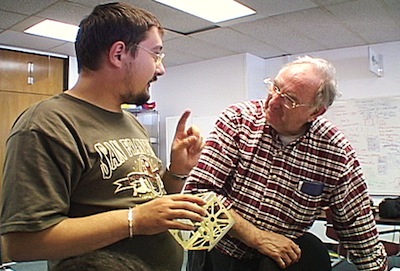 Bob Twiggs, then a professor at Stanford University, faced a problem in the late 1990s. He realized his students needed hands-on experience to become better engineers, but the barriers to entry into the satellite business were high -- too high for most university budgets. Twiggs looked to Beanie Babies, a popular line of stuffed toys, for inspiration. Twiggs says he wanted to constrain students to a miniature satellite, ensuring development costs would remain affordable for academic programs. The idea was to allow students to build their own version of Sputnik, a no-strings-attached satellite with the ability to generate electricity and radio home. Later CubeSat iterations would host cameras, plasma sensors, tethers, solar sails and other advanced technologies. The basic CubeSat is a 10-centimeter (4-inch) cube with a volume of exactly one liter and a mass of less than 1.33 kilograms (2.93 pounds). If a builder meets those specifications, they can put almost anything they want inside, Twiggs said. Twiggs and Jordi Puig-Suari, an engineer at California Polytechnic State University, developed the CubeSat form factor, a standardized platform that helped CubeSats proliferate to dozens of countries, companies and institutions on six continents. They also designed a mechanism to house CubeSats during launch. Called a P-POD (Poly-Picosatellite Orbital Deployer), the device can be attached to a launch vehicle and will shoot the CubeSats into space once the mission's primary passenger is safely away. CubeSats can be scaled up to two, three or six of the 10-centimeter units to add capabilities. Nearly 200 CubeSats have launched since 2003, and more than half of them went up in the last year. "We're flooding the skies with them," Twiggs said. Two launches in November by converted Cold War-era missiles launched more than 60 small satellites, most of them CubeSats. 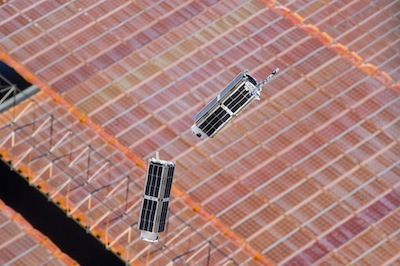 In early January, an Orbital Sciences Corp. Cygnus commercial cargo freighter delivered 33 CubeSats to the International Space Station, including a 28-satellite imaging constellation owned by San Francisco-based Planet Labs Inc., which aims to distribute medium-resolution views of Earth to commercial and humanitarian users. 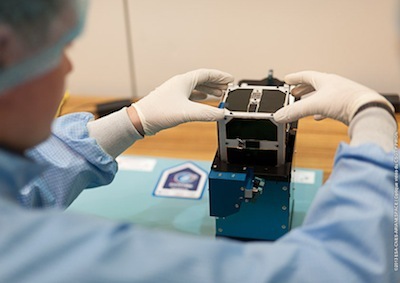 The Planet Labs satellites were released from the space station in February from a specially-designed dispenser. Twiggs is still working on CubeSat projects as a space science and astronautical engineering professor at Morehead State University in Kentucky. He recently pioneered the PocketQube, a satellite platform with one-eighth the volume of a CubeSat. The first four PocketQubes launched in November for U.S. and German companies and universities. He spoke with Spaceflight Now at the end of 2013 to recount the genesis of the CubeSat initiative and offer advice for would-be CubeSat builders. Question: How did you come up with the idea for CubeSats? Twiggs: It started in 1999 when I was at Stanford University. In 1995, I had went and started a small satellite program in the aeronautics and astronautics department. The satellites we had been building were microsatellite-class satellites and one of the things that was my objective was I wanted to try and get students through the process of actually building and launching a satellite when they were doing their master's degree in a period of about two years. It turned out the students, if you have a larger satellite, they kept coming up with ideas of more things they want to add to it. I had a terrible time trying to get them to finish the satellite. I'd tell them I wanted it finished and they said, "Well, you get us a launch and we'll finish it." I said, "When you finish it, I'll get you a launch." It ended up taking until after 2000 until we got our first launch. It wasn't something we could afford -- the launch -- so we had to depend on other people. We got this launch through some collaboration with some people that got DARPA funding. It was a launch on a satellite called OPAL and it actually launched some picosatellites, a mother satellite with some daughter satellites in it. After we made that launch, I thought why don't we come up with something roughly the size of this picosatellite, and it was about the size of a Klondike ice cream bar. It was flat and long, and the thought of building a spacecraft was that if you're not going to have an attitude stabilization on it, you have to have solar cells on all sides. So what I did is I started looking for something to pattern after. I went to a plastics shop and I found a 4-inch plastic tube that was used for storing Beanie Babies. There was a Beanie Baby craze at that time, so I bought this box and looked it over and thought about how do I hold the box to launch it, how many solar cells could I put on it, and I come to the conclusion that I could put enough solar cells on it to probably get about an average of a watt of power out of it. So I designed this thing such that I wanted to put them in some sort of launcher tube and so I designed a tube with little rails on it that would hold the box along the corners. That's how the design of the launcher came along and we decided we could put about three of them in there. Then I collaborate with the guys at Cal Poly and they went ahead and built the launcher and built some of the models for the first CubeSats. Our major reason for doing this was we wanted something that we could afford to launch for a reasonable price. For the students, if they just built a Sputnik and flew it then that was a really good education, and so that's what we came up with. We started desinging these things, both at Cal Poly and us at Stanford, but we never thought about taking these CubeSats and attaching them together. We thought they all would go up separately. But actually the first CubeSat we launched from us at Stanford was what we call a 3U, there were three of them together and we did it with a company called QuakeFinder and the satellite was called QuakeSat. It had an extension that came out of it that we used to look for electromagnetic waves that were generated by earthquakes. So it was kind of an earthquake-finder or predictor. That's the way it went. Question: Did CubeSats catch on immediately? Twiggs: It all started as a university education program satellite. It was kind of funny. I didn't think that people would criticize it as much as they did, but we got a lot of feedback, you know, "That's the dumbest idea I've ever heard. Nobody's going to use this toy." We said, "Who the heck cares. We'll go ahead and use it. We're using it for education." Another thing that was kind of funny is we had no interest from NASA or any of the military organizations. It just wasn't anything they were interested in, so it was all funded without any funding from those aerospace organizations. I'm kind of glad that NASA didn't help us, or we'd probably never got it done. It was developed for the education of students. If you make it small, they can't put much in it, so they get it done quicker, and hopefully you can get it launched for a lot less money. I don't think Jordi Puig-Suari at Cal Poly or myself had any idea that we'd see days like this. Question: How did your idea turn into a CubeSat standard everyone could use? Twiggs: We figured out a way to do it, and somehow that became the standard. We built the launcher to launch it, and that required that the CubeSat be a certain size. We never told anybody what to put in them. All we said is you have to be a 10-centimeter cube, and we did that just so people would know the physical size. But there was never any rule, and there still isn't any rule, about what to put inside of them.